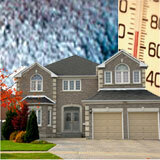 Welcome to H & E Weatherization web site. At H & E Weatherization, our goal is to provide the highest quality products and superior service to our customers along with keeping the environment in mind. That's been our number one priority since our beginning. H & E Weatherization was incorporated in 1983 by Hamid Nayeri. 2010 represents our 27th year serving the Greater Des Moines, Iowa area. We are thankful for our customers who have sustained our business over this time.